What’s It About? : On a balmy Texas night in 1989, Richard Dane shoots low-life burglar Freddy Russell who breaks into his home. Despite being hailed as a hero in the small town, Dane soon fears for his and his family’s life, when Freddy ex-con father rolls into town. Yet nothing is as it seems as Richard’s life begins to unravel into a dark underworld of corruption and violence. How can a split-second decision change your life? Verdict: Director Jim Mickle steps away from the horror genre of his previous films to adapt Joe R Landsdale’s novel of the same name. In tone, Cold In July is very similar to Winter’s Bone and True Detective. Yet this film brings a different kind of tension, one that hits directly from the get go and just tightens as it continues. Mickle layers the film piece by piece as we follow Dane’s descent into a life less ordinary. It constantly begs the question what would you do in the same situation – fight or flight? As the story becomes clearer, the elements to the story get darker with a ripple effect that escalates into a rising tide of terror. Mickle’s direction is very much like the early days of Scorsese. It’s got that raw and gritty feel that comes from shaping an intelligent and highly provocative movie. Michael C Hall is a world away from Dexter here, more like back in the mould of David Fisher. A quiet man with little to say but the world going through his mind. The role isn’t much of a stretch for Hall, but it’s good to see him advancing his genres and styling. We feel pity for him throughout as he’s caught in a mess that may have started with him, but he shouldn’t be this far down the rabbit hole. Sam Shepherd is the crotchety old timer here to seek revenge, with a low growl of a voice and only the smallest of words to say he is the danger man in the film. Yet it’s Don Johnson that steals the film with his character of Jim Bob, who is hilarious and nasty in equal measures. If you met him on the street you wouldn’t know if he’d buy you a beer or punch you in the face. A deeply complex character that let’s everything hide behind a comedic facade until the demon appears in his eyes. Cold In July’s added benefit is that the entire film is scored to a progressive 80s synthesizer soundtrack. With echoes of music from Tangerine Dream and Giorgio Moroder, this is one stylised soundtrack that is as instantly captivating as Drive’s soundtrack was a couple of years ago. Big looming bass with synths pinging in and out creating a dark, foreboding and nasty reverberating piece of work. 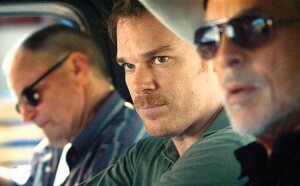 Final Words: Cold In July twists and turns its way through a butterfly-effect type storyline. It’s a ghoulish nightmare of a crime thriller. Cold In July is released in the UK on 27 June 2014.